Health literacy is the degree to which individuals can obtain, process, and understand the basic health information and services they need to make appropriate health decisions. Nearly half of all American adults - 90 million people - have inadequate health literacy to navigate the health care system. 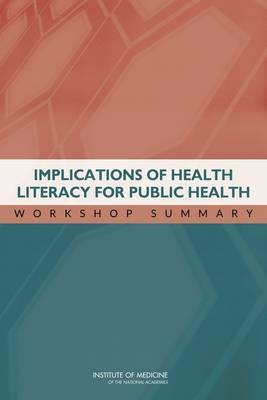 Implications of Health Literacy for Public Health is the summary of a workshop convened by the Institute of Medicine Roundtable on Health Literacy in November 2013 that focused on the implications of health literacy for the mission and essential services of public health. The workshop featured the presentation of a commissioned paper on health literacy activities under way in public health organizations. Other presentations examined the implications of health literacy for the mission and essential services of public health, for example, community health and safety, disease prevention, disaster management, or health communication. This report includes the commissioned paper and summaries of the workshop presentations.